Welcome to Rock Creek Estates, one of many new communities by Chattanooga's newest builder, DR Horton. Rock Creek Estates offers 29 level lots in the heart of Sale Creek just off Hwy 27 and Daughtery Ferry Road. Easily commute south to Soddy Daisy & Hixson or north into the town of Dayton. The Shane Plan offers a wonderful combined living and dining room area just off entry with adjacent family room. A great open space for easy living. The open kitchen to the family room allows for easy entertaining with breakfast area, kitchen island, ample counter space, and access to back patio.The second level boasts the master bedroom with private on suite bathroom with large walk in closet, two guest bedrooms with shared hallway bath and a convenient laundry room. This home offers a covered front patio, open back patio and two car garage. 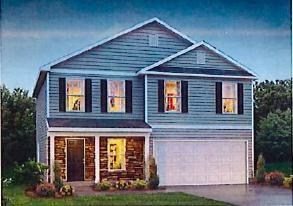 Don't miss this opportunity to own a new construction home in northern Hamilton County between $184,000-$225,000.